Do you have a Gravatar yet? If not, I highly encourage you to get one right now. Gravatar (which stands for Globally Recognized Avatar) is a play on the word “avatar” which is a photo, image or other representation of you online. This free service allows you to upload a photo that it then automatically associates with whatever email address(es) you tell it to. Once you set your account up, your Gravatar will display your photo beside your name whenever you comment or post on a blog, publish articles, set up profiles… a whole host of things. This helps instantly and automatically identify your online articles, comments and posts on blogs, forums, websites, etc. This is super helpful to you in your business because it puts a face with a name which makes you more memorable to people (any of whom could be your next potential clients). By visually branding all your online content with your face, you stick out more. The more your face keeps popping up, the more people start to notice and recognize you wherever they go online. This helps grow the “know, like and trust” factor exponentially; the more they see your face, the more they feel like they know you and can trust you. You can upload any image you like; however, I suggest you avoid logos and caricatures. These do nothing to humanize your business. Stick with a nice headshot. Your image packs a more powerful punch in creating rapport. That’s because first and foremost, people do business with people. They notice and look at photos of other people far more than any other kind of image. It doesn’t even need to be by a pro as long as it’s clear and pleasant: fix your hair, wear something presentable and smile warmly. This will suffice until you are able to get some pro shots taken. Setting your Gravatar up is quick and easy. You can add as many email addresses as you want and swap out your photo anytime. You can learn about more of its uses and how to do things on their support page. And, like I said, it’s free, so there’s really no reason not to take advantage of this very handy marketing tool. Go set your Gravatar up now, then post a comment below to see how it looks! 2 Comments Posted in Being Human, Best Communication Policies, Establishing Rapport, Free Goodies, Free Stuff, Marketing. Bookmark the permalink. 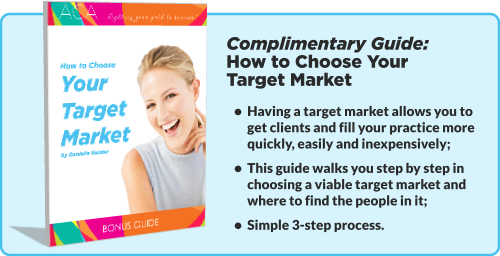 I just completed an updated version of my guide How to Choose Your Target Market. Clarified some concepts and instructions that I think will help people more easily wrap their brains around target marketing and how to choose the right one for them. Even if you already have this guide, this is a new and improved up-to-date version so you’ll definitely want to grab your copy (it’s still free!). You will build your business, get clients and make more money more quickly and easily with a target market. Having a target market makes EVERYTHING easier in your business. What do you think? Leave a comment! Posted in Free Stuff, Getting Clients, Great News!, Marketing, Special Announcements, Target Market. Bookmark the permalink.